Thinking of signing up for a Kasu Tour but want to make sure you’re getting the best deal? What is the total length of the tour? What is the daily cost of the tour? Maximum number of guests on the tour? How many destinations/experiences are there in the tour? What is the quality of the accommodation? How many nights does the tour spend at each destination? Method of transport: private vehicle or a mixture of public transport? How many meals are included in the tour cost? Are entry fees, safari fees, local guide fees, driver tips etc included in the cost? Do you have the undivided attention of your Australian host for the entire tour? At Kasu Tours, we feel confident that our apples shine brighter than the other apples on this list of comparisons. What do you think? Our recent CLOTH and STONE TOUR to Gujarat was a huge success and my guests had a great time. “For nearly three weeks in January, I travelled within Gujarat, India with our tour guide, Beverley Bloxham and four other guests. The tour was named The Cloth and Stone Tour and it well and truly lived up to its name. Every day was filled with fascinating activities and local guides were employed to ensure we gained the greatest insights to the places we visited. For me, the most heart-warming and memorable times were those in dusty, humble and relatively remote villages where the the standard of weaving, tie dying, wood carving and lacquer work had to be seen to be believed. How special to be able to purchase directly from the artisans. Through Beverley’s research and previous trips to India, we were able to visit Dr Vasa who showed us his precious private collection of Indus Valley civilisation artefacts – some as old as 4500 years old, and in an extraordinary contrast to the small village experience, to visit Asif Sheikh who is world renowned for his embroidery and who showed us his latest collection, destined for the international catwalk. “What a fabulous trip – Jill and I are still talking about it. Thanks so much for sharing your knowledge, insights and stories and your introductions to such a vast range of artisans. Truly an enriching experience. Some images from the museum collection. Click on the images to enlarge. “An institution of design for traditional artisans. Kala Raksha Vidhyalaya (KRV) evolved from years of design development based in the Kala Raksha Museum. KRV is an educational institution open to working artisans of Kutch, conservatively estimated at 50,000. It aims to provide knowledge and skills directly relevant to the artisan’s traditional art to enable market appropriate innovation, while honouring and strengthening the tradition. As working artisans can rarely leave their homes and profession for long periods, the course is a series of modular classes conducted over one year in a local residential setting, using the vernacular language. The institute focuses on establishing long lasting market links. Our day at Kala Raksha began with a visit to the museum display housed in a traditional ‘bhunga’. A traditional mud built and thatched bhunga, decorated, like many of the textiles, with tiny mirrors. Detail of the tie-down system on the thatched roof of the bhunga. Amongst so many things, we learned that within a community’s traditional embroidery technique and design motifs, there is much room for personal expression. This is particularly important when a young couple are betrothed. As they are not allowed to meet before their wedding day, a series of gifts are exchanged, and a girl will typically send embroidered items to her betrothed and his family. It is through the quality of the embroidery and the motifs used that the groom and his family are able to decipher the qualities and personality of the future bride. Next we were shown some of the historic collection, stored safely in flat drawers with traditional insect repelling herbs and spices tied in muslin to protect the precious textiles. Then we joined some of the local ladies who instructed us in the finer points of the various stitches used in the textiles of the various communities of the area. A break for lunch with the ladies, and then several more hours trying to learn the intricacies of the stitches. In my case, it was not so much learning the stitches, but increasing my awe and respect for the makers of these extraordinary textiles. Everyone getting involved with the stitches. From left: Margot, Carol, Pauline and Jill in front with our lovely teachers. Deep concentration from Pauline (left) and Sue (right) as one of the ladies demonstrates her stitching technique. One of our very patient tutors. Sue learning from her stitching tutor. A lot of concentration from both tutor and student, Carol. Whilst the preservation of tradition is paramount at Kala Raksha, innovation is also taking place. Artisans are telling stories through the technique of appliqué as well as applying their traditional stitching skills to a vast range of wonderful products available for purchase in the on-site shop….. we spent quite a lot of time, and rupees in there! One of the narrative appliqué panels showing scenes from the life of Gandhi. A detail from another narrative panel about monsoon time. Note the use of scraps of block printed fabrics. Another detail of another panel. It’s been a busy week on the road with the Cloth and Stone Tour of Gujarat: too busy even to get this blog written! So instead of day by day, here is a brief account of our first week. Our week began on Sunday in Ahmedabad. Sunday is the day for the Ellis bridge flea market where anything and everything an Indian family might need can be found. Goats, hairbrushes, motorcycle parts, new cloth, secondhand clothes, saris, all manner of food and drink etc. Most foreigners do not find this market and our group soon became the focus of attention: many requests for selfies with us, hold the baby, taste this food, buy that thing, but mostly good natured banter in simple English from them & simpler Hindi from me. Our group had a great time there, returning happily to our hotel after this encounter with a slice of the real India. In the afternoon, we headed to the old city first in pursuit of a famous family of cloth sellers, Gamthiwalla, who have been selling their block printed and/or hand woven cloth for generations out of the same tiny shop a few metres away from the ancient Jama Masjid (mosque). Being Sunday, Manek Chowk ( the old city market) was crowded edge to edge as far as the eye could see. Our auto rick driver dropped us us off some distance from our destination, with the promise of “5 minutes walking only”. After a good half hour of negotiating the crowds, stopping often to ask the whereabouts of the shop, we finally found it. Closed. After walking around the mosque for a while enjoying its architecture, we headed off to our second destination – a restored heritage house owned by some friends of mine to observe the old building style from the inside and to meet up with Jagdip and his extended family who live at and host paying guests at their beautiful 200 year old award winning home. After the ladies returned from the Calico Museum full of awe and wonder at the collection and the experience that one has in being admitted to the collection, we headed to the Gandhi Ashram. Mahatma Gandhi was born in the state of Gujarat and he selected a place on the bank of the river Sabarmati very close to the Saint Dadheechi’s temple as well as a jail and a crematorium. Gandhi used to remark, “This is the right place for our activities to carry on the search for Truth and develop Fearlessness for on one side are the iron bolts of the foreigners and on the other, thunderbolts of mother nature.” After building a few essential structures, the activities of the Ashram commenced in 1917. He stayed in the ashram for many years before he began the salt march to Dandi on 12 March 1930. Tuesday was the day when we connected with our comfortable 12 seater tourist coach with its amiable and capable driver, Gajendra. Both will be our constant companions for the reminder of the trip. And Tuesday was also the day we escaped the city to drive north to see first the Sun Temple at Modhera, and then to Patan, the old capital of Gujarat, to visit the Patan Patola (double ikat weaving) Museum and the World Heritage listed Rani Ki Vav (Queen’s Stepwell). The Sun Temple – an eleventh century jewel of a temple complex came into view through green manicured gardens and shady trees, with gardeners sweeping up leaves. After all the gritty suburbs, chaotic traffic and dusty dun coloured countryside we had driven through, this was a relief for eyes and soul. The first monument one comes to is the Surya Kund – beautifully a carved stepped tank that was named after the sun god. Still holding water after all the centuries since its construction, fine architectural details are doubled in perfect reflection. The other two monuments are Sabha Mandap – the hall, where people would gather for discussions on religious topics and Guda Mandap – the sanctum sanctorum, also known as the main temple. On my last visit here a year ago, there were no guides to be found, so the iconography in the fabulous carved stone temples was a mystery to me. Luckily, on our visit there was a guide available, and for a measly Rs200 (about $4), he explained myths and legends and the sagas of the gods depicted here. After a healthy lunch of fruit and nuts in the shady gardens of the Sun Temple, we headed off to Patan 20km away – our first stop, the wonderful Rani Ki Vav. Next stop was the Patan Patola Museum…… see next missive, coming soon. This tour took place in February 2016. If you are interested in a similar tour, please connect with me via the CONTACT page. 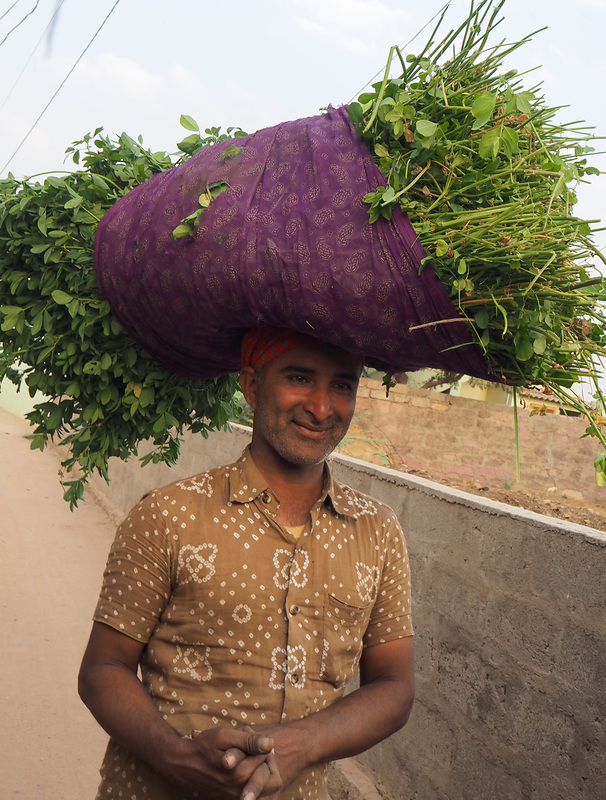 This tour was created for those who like to see India through the lens of fair trade. Our clients are people who care about where their purchases come from and that the makers are being paid and treated fairly. They are also interested in visiting remote places to meet the makers and see the goods being made. Through my research into fair trade organisations in India, I have enjoyed searching out quality stock for my online shop, KASU EMPORIUM. Now it is time to share the journeys with like-minded others. As with KASU EMPORIUM, a percentage of profits from KASU TOURS is donated to charities we work with in India to improve the lives of people living in poverty. During the course of the tour, we meet makers and artisans working in traditional weaving, tribal arts, block printed fabrics and more. The places we visit all adhere to fair trade principles. But India has such a wealth of wonderful things to see and do: in each destination, we also visit some local sites of importance. For example, Jantar Mantar in Delhi, the Museum of Man in Bhopal, the Anokhi Museum of Hand Printing in Jaipur. We take various forms of transport in our travels within India including flights, trains, private buses, rickshaws and taxis. The ground level journeys are more than getting from point a to point b – they are opportunities to see India up close: the landscape, the women in brightly coloured saris, children playing, farmers farming, nomads with their herds, bullocks, colourfully painted trucks with their musical horns and of course the various landscapes … it is all a colourful experience that cannot be had from 30 000 feet up. To take a virtual tour in the order of travel, click on the link at the bottom of this page. Continue in this manner and you will ‘visit’ each destination. There are more links on each destination page to some of the places included in the tour and some extras that may be visited in the free time we have in each place. 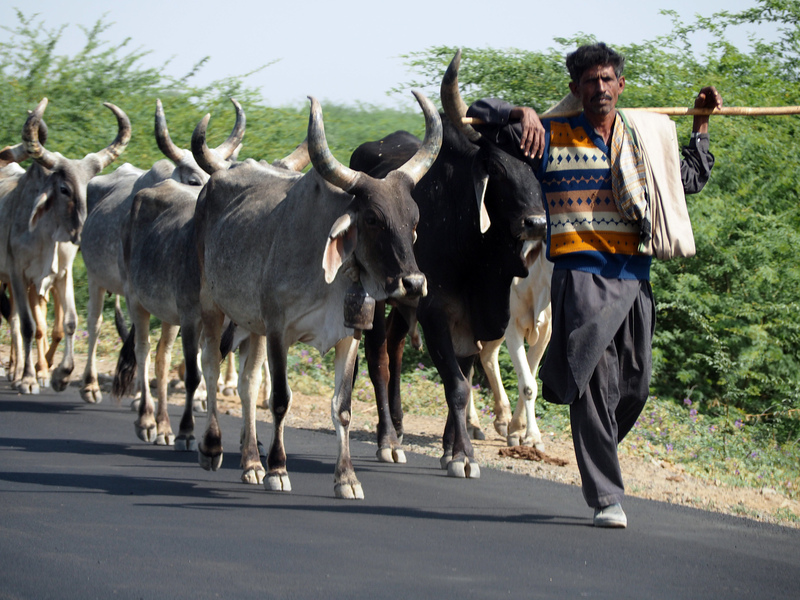 Fellow travellers on the road north, Kachchh. The Timeless Varanasi tour begins in the city of Ahmedabad and takes us to Varanasi to immerse ourselves in the history, culture and spirituality of this ancient city. Click here to check out some of the sights you might encounter on the tours. I love taking detours into villages and on the way from Bhuj to The White Rann my driver is taking me to visit Nirona to see some very special craftwork: the very rare to the point of being endangered, Rogan work. A friend and I visited a small village outside Bhuj to see some Arjarkh printing – a style of block printing local to this area. We hired an autorick to take us there and our driver and his mate – both sharing the tiny front seat designed for one – had some English and great senses of humour, and with my rudimentary and Daniella’s much better Hindi, we all got on very well for the duration of the trip. We had a lovely time with the textile artists and spent quite some time making our selections to take away with us. But the most memorable moment of the day for us was as we were leaving the village. Heading out of town, we saw a guy, slightly greying in his long stubble, so maybe in his 40s, walking towards us with a big bundle of greens wrapped in a purple cloth on his head. He had an angelic smile and it was something about his manner and the elegant walk, his confidence, his choice of colours, his headscarf, that compelled us to stop and ask if we could take his photo. He was delighted, and as he shifted his weight to create a photogenic pose, it occurred to me that he was gay. Daniella spotted it too, and as we snapped our pics, he kept striking poses in ever more camp styles worthy of anything from Priscilla Queen of the Desert. He was having a lovely time and one of our drivers, not wanting to miss being photographed, decided to pose with him, at which point our village guy really vamped it up. The driver at this stage hadn’t realised he was being snapped with a gay guy, as open homosexuality is rarely seen in India, and certainly unusual in a tiny village like this. But the best was yet to come. Photo op over, he gave a polished catwalk-style turn to continue his way home and gave the most high-camp mincing walk I have ever seen and disappeared around the corner without a backward glance as we applauded and whooped his magnificent exit. This guy was certainly happy in his skin as his serene yet mischievous smile attested. Moments later, it dawned on our driver that he had just been posing in the arms of a ‘gaanda’ and he nearly ran off the road in mock disgust, then broke into uncontrollable giggles. Of course that set us off, teasing him and also not being able to control our laughter. The whole way back to town was punctuated with more spontaneous bouts of laughter to the point of tears. Footnote: two days later in another village about 50km away from the first one, walking the tiny lanes, we turned a corner and there he was again. Smiles all round, and of course, more gorgeous poses. In all the theatre, I forgot to ask his name, so to the anonymous ‘only gay in the village’ thank you for sharing your beauty and the fun! I am staying in a mud-built resort – an initiative of and located in the village of Hodka in northwestern Gujarat, not far from the famous White Desert or Rann of Kachchh. Meals are taken in the large open-air pavilion with grass roof and ceiling of colourful fabric. The central food station is attended by a group of lovely young men from the village. They are really friendly and I try to remember their names. In the tourist season they work here, then in off-season (summer – when it is way too hot for tourists) there are other jobs to do. Natha is from a family who do mud work and wall painting. Mani is 16 years old and the lowest in the pecking order here, doing general cleaning work and food serving. He has the biggest whitest smile always ready to light up his brown face, and tries to please all the time. Valji is one of the serving staff. He is a member of the family who do all the resort’s mud and mirror work for which this region is famous. They also make the wattle and daub fences and paint the walls with traditional designs. In the off-season, he goes to Mumbai and Delhi and works on mud-work commissions and he is planning on creating a bird sanctuary nearby. Valji, who will be married in March after a thirteen year engagement (he and his future wife must have been betrothed as children), sensed my genuine interest in the place and the people and gifted me a book which I find both fascinating and educational. 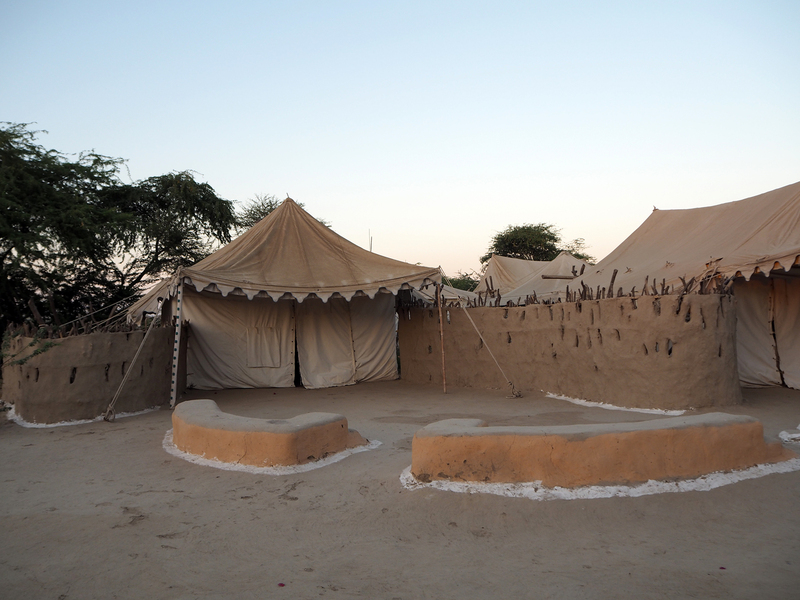 It outlines the biocultural community protocol of the Maldharis of Banni (the pastoralists of the Banni grasslands in this district in the north of Kachchh, Gujarat). The Maldharis have been the custodians of the biodiversity-rich Banni grassland ecosystem and have protected it and nurtured it for over 450 years. This is an important document with the agreement between at first the Maharajah Radheshua-ji of Kachcch in the 18th century. There is documentary evidence (reproduced in the book) that the Madlharis have paid pancheri (grazing tax) since old times, in exchange for the right to graze their animals in Banni without any private land allocation or agriculture. It seems to me uncertain that contemporary governments have ratified this protocol and this document is a well researched and produced call to action to continue the historical rights of the Maldharis. We believe that nature has entrusted us with the responsibility to protect Banni and the right to practice our traditional way of life in the Banni and through this biocultural community protocol we call on the government to respect and affirm this right. In Maldharis biocultural community protocol we clearly state who we are, where we live, our relationship to Banni and our animals, our rights to land, our breeds and associated traditional knowledge and our duties to protect this ecosystem. Our elders have told us that in 1736, and army from Sindh (now in Pakistan) led by Khaloda Mohammad Mir invaded Kachchh . Our ancestors were asked by the Maharajah Radheshua-ji of Kachcch to fight with his armies and defend the land from invaders. Though we lost many lives and suffered much in the ensuing battle, the Maharajah was, with our help, victorious. To reward our loyalty and valour, the Maharajah gave the Maldharis title to the Banni. As we were pastoralists the Maharajah also decreed that the grasslands should not be used for agriculture. From further reading, I learn that the Maldharis have developed the unique Banni buffalo especially adapted to the grasses of the Banni. The Maldharis hold their cattle in high regard. Some of us take our shoes off before we enter the place where our animals lie. Historically the measure of a man was based on different animals he kept. A Maldhari who had a good pedigree pure animals and expert in traditional knowledge was known as ‘bhagiya’ – he who is lucky with animals. They have also developed a unique water harvesting system that enables them to suvive the harsh Kachchh summers. Temporary wells known as ‘virdas’ are built as a community activity by all the men of the village. The shallow wells are built in the place where a water hole has dried up but where ground water is not far below. The well is lined with logs of wood and Banni grasses: the wood prevents the well from collapsing and the grass filters the water. 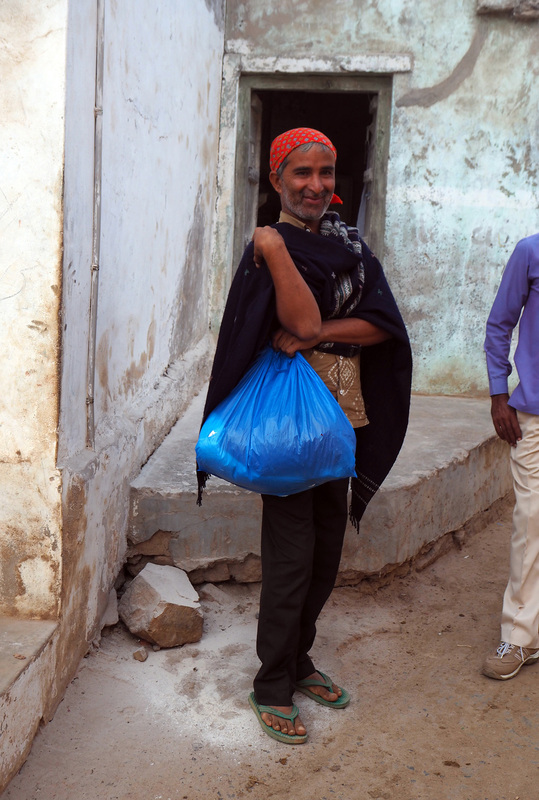 I also learn that there are 18 Muslim communities and two Hindu in the Banni. There are strong ties between the communities and in solidarity with the Hindu, the Muslims refrain from eating beef. The Muslims provide milk and ghee to the Hindu Meghwals, who in turn provide leather shoes, saddles, water satchels and help building their bhungas (round houses). The book goes on to list all the grasses of the Banni with images, the various tribal groups, the indigenous livestock and breeding protocols, and even home-grown vetinary treatments and much else. 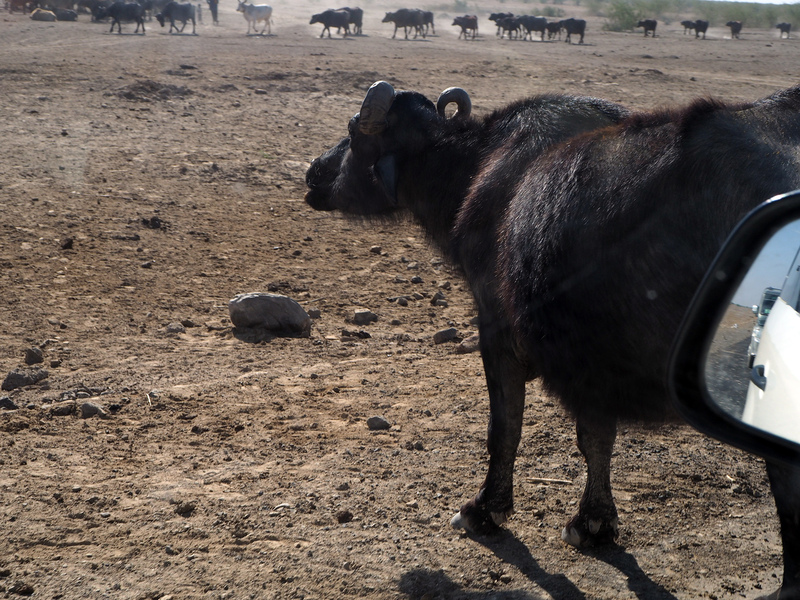 Challenges to their way of life are also catalogued, chief amongst them is poisonous effluent from industry on the fringes of the Banni: buffalo are dying because of poisoned waterholes. Another threat is police harassment. I am finding it fascinating to delve a little deeper in the various cultures of India, and treasure this book and the brief time I have shared with the Maldharis of Kachchh. For textile tragics like me, Kachchh, in the western region of Gujarat, is a treasure trove! Departing Ahmedabad on the Pune/Bhuj Express, I headed west to Bhuj, the major town in the western region of Gujarat, Kachcch (Kutch). The seven-hour train trip passed quickly in my tiny, dirty but private 1AC compartment (first class air con – read: private with door and fan) for the 359km trip. For most of the time I caught up on some much-needed sleep and when awake, trying to keep up with these missives. The Sanskriti Kendra Museums are housed within Sanskriti Kendra, an artist village complex, spread over eight acres, 10 km south of New Delhi.